Product Consist: Bouquet of 4 Cute Teddy Bear in a tissue paper very nicely wrapped with bow tie on it. Teddy is combined exquisite toys a traditional and together becomes a new bouquet. 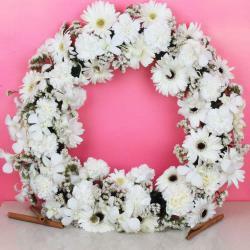 It's a very good choice either home decoration or as gift to family or friend, lover. The teddy bouquet will not wither and can keep for a long time, it's really very eco-friendly. You can present this cute bouquet of teddy bears to the person you love. This gift certainly shows your love and care for them. The paper packaging with a knot holding teddy bears looks adorable. 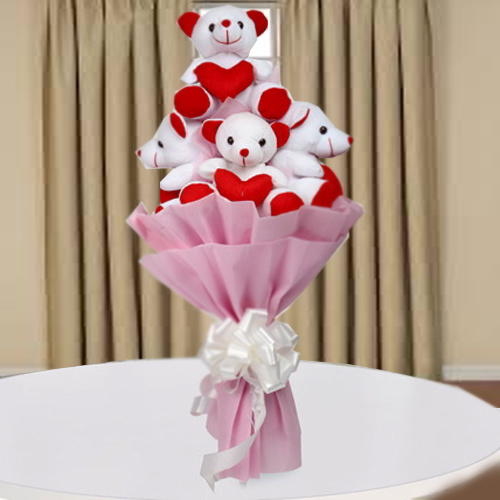 So order now to surprise your loved ones with this amazing teddy bouquet from Giftacrossindia. Product Includes: Bouquet of 4 Cute Teddy Bear in a tissue paper very nicely wrapped with bow tie on it.